Artist’s impression of the 4,800MW New Capital power plant. Image: courtesy of www.siemens.com/press. 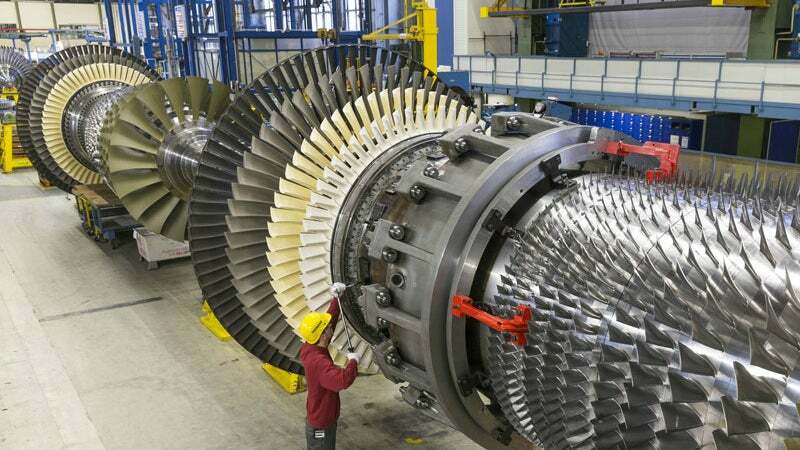 The New Capital power plant will integrate eight Siemens SGT5-8000H gas turbines. Image: courtesy of www.siemens.com/press. Four SST-5000 steam turbine generators will be installed in the power plant. Image: courtesy of www.siemens.com/press. The new combined-cycle power plant (CCPP) will be located in the proposed new capital of Egypt, approximately 45km east of Cairo. It is scheduled to become fully operational in the first half of 2018. The project site of the power plant will extend over an area of 744,811m². The plant will integrate eight Siemens SGT5-8000H high-efficiency combustion turbine generators (CTGs), eight Benson heat recovery steam generators (HRSGs), four SST-5000 steam turbine generators (STGs) and four air-cooled condensers. Each combined-cycle module will have a rated capacity of 1,200MWe. The balance of plant (BOP) systems will include a diesel generator, transformers and switchgear as well as associated mechanical / electrical subsystems. The dual-fuel plant will use natural gas as primary fuel and light fuel oil as a back-up fuel. It will receive natural gas from a new underground connection pipeline, while light fuel oil will be supplied by trucks from Musturod or Helwan oil refineries. A water treatment facility will be built on the site to supply potable water for the power plant. The project will also integrate a wastewater treatment facility to treat liquid waste generated by the power plant. Other ancillary infrastructure includes a logistics building, gas handling facilities, fuel feeding system, fire-fighting facilities, ventilation and air-conditioning systems, a chemical laboratory, and communication systems. The power generated by the New Capital power plant will be transmitted to the Egyptian Electricity Transmission Company (EETC) electricity network via new overhead transmission lines. The low-voltage power produced by the plant will be stepped up by main transformers before being fed into the 500kV grid network through a new substation with gas-insulated switchgear (GIS). Siemens along with its consortium partner Orascom Construction is responsible to provide engineering, procurement and construction services for the power plant. Orascom Construction subcontracted Power Generation Engineering & Services Company (PGESCo) to deliver detailed design for BOP systems, civil designs, procurement support, construction management and commissioning services for the plant in August 2015. The power plant is estimated to cost €2bn ($2.23bn), of which Orascom Construction’s combined share of the deal is worth €1.6bn ($1.78bn). The company, on behalf of EEHC, staged a 15-year funding package for its share. Siemens achieved financial closure for the project in March 2016. The funding scheme for Siemens’ part of the deal was structured by Siemens Financial Services (SFS). Deutsche Bank, HSBC and KfW IPEX-Bank arranged the Hermes-covered loan for the project. The loan is being financed by a consortium of 17 international banks.